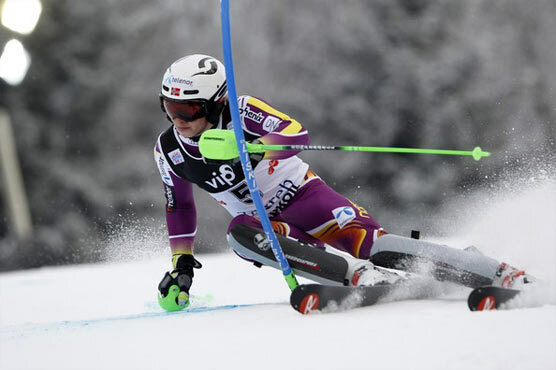 KRANJSKA GORA, Slovenia (AP) – Henrik Kristoffersen of Norway won a men s World Cup slalom Sunday, while Marcel Hirscher recovered from a disappointing first run to place sixth and extend his lead in the overall standings. Kristoffersen was third after the opening leg and used a strong final run to finish in a total time of 1 minute, 41.26 seconds for his third career win, beating 2010 Olympic champion Giuliano Razzoli of Italy by 0.24 seconds. Mattias Hargin of Sweden dropped from first to third, trailing the Norwegian by 0.86. Hirscher posted the fastest second-run time to improve from 19th and further extend his overall lead over Norway s Kjetil Jansrud to 164 points with four races remaining. Jansrud skipped Sunday s slalom. Felix Neureuther of Germany, who leads the discipline standings, finished ninth.